Two things I ended up taking back from Byron Bay: a bag of Byron Chai mix (which is quite good; one of the better chai mixes I've tried), and a small jar of lemon aspen jelly (which tastes like lemons, only perhaps slightly more sour). 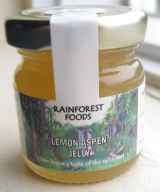 Apparently lemon aspen jelly is made from lemon aspens (a native plant that only grows in Australian rainforests), and not lemons aspen (though it sounds like it should be). Most of the population appears to be tourists; mainly young people (permanently or temporarily) associated with the Skeg subculture. Maybe this is just a summer thing. Furthermore, most of the people employed here (at least in tourist-related industries) appear to be either British or Canadian. The notorious yuppification: there don't seem to be too many signs of it; a few luxury cars here and there, and the prices in the local real-estate shop windows (you won't have much change left over from a million if you buy a place here). Alas, there are no 802.11 access points anywhere in town; mind you, WiFi in Australia appears to be mostly a Sydney thing. Were I a wealthy man, I'm not sure that my first choice of locations for a summer residence would be a town swarming with hordes of young tourists. Having said that, things cost about twice as much as they do in Melbourne; you can spend almost $10 on a croissant and a pot of chai, or $25 on a curry dinner (albeit a mango curry you're unlikely to get back home). Virtually all the cafÃ©s serve chai, as well as something called LSD (the last two letters standing for Soy and Dandelion). All in all, I liked Byron Bay, though I can't help get the feeling that the town was a lot more charming before it became so popular. I suspect that over the next few decades it may turn into another Gold Coast.